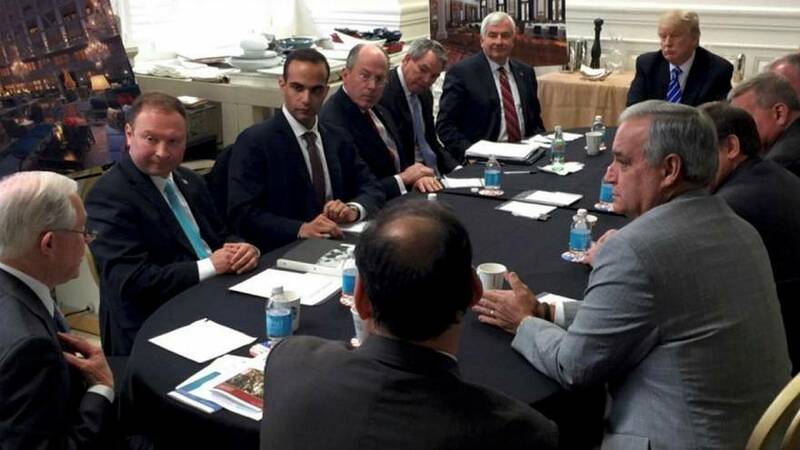 George Papadopoulos (pictured, above, third from the left), a campaign advisor to Trump, has admitted lying to FBI agents over when he learned from a foreign professor that Russia was claiming to have ‘dirt’ on presidential rival Hillary Clinton. Papadopoulos initially said he had been in contact with the unnamed professor before joining Trump’s campaign team in March 2016, say prosecutors. But in fact, they say, he only met with the professor after joining. The professor told Papadopoulos, after returning from a trip to Moscow, of learning that the Russians had obtained ‘dirt’ on then-candidate Hillary Clinton in the form of ‘thousands of emails’, according to court documents. According to court documents, Papadopoulos was seemingly under the belief that he had met Russian president Vladimir Putin’s niece. He is said to have emailed a campaign supervisor and colleagues telling them he had met with the aforementioned professor and a female Russian national who was described as Vladimir Putin’s niece. The court documents clarified in a footnote the female was not Putin’s niece. A month after joining Trump’s campaign team, Papadopoulos emailed a senior colleague suggesting Putin was ready to met the presidential candidate, according to court documents seen by NBC News. His message included the phrase: “the Russian government has an open invitation by Putin for Mr Trump to meet him when he is ready”. Correspondence between Papadopoulos and his campaign colleagues continued about setting up an ‘off-the-record’ meetings with Russian officials. Then, around August 15, 2016, a campaign supervisor told Papadopoulos “I would encourage you” to “make the trip, if it is feasible”, according to court documents. However, despite this communication, no meeting took place. Before Papadopoulos admitted lying to FBI agents, Paul Manafort, Trump’s former campaign manager and a business associate, Rick Gates, were charged with multiple offences. They included money laundering, conspiracy against the United States and failing to register as foreign agents. But the charges relate to Manafort’s dealings before he became Trump’s campaign manager. They also have no direct link to special counsel Robert Mueller’s ongoing investigation into possible collusion between the Trump campaign and what U.S. intelligence agencies concluded was a Russian bid to boost Trump’s candidacy. However Mueller could be using the indictment to pressure Manafort and Gates to cooperate in the larger collusion probe.